Chris Hadfield not only believes humans will live on the moon in his lifetime, but that we could reach Mars within 70 years. These days, most people are a little skeptical about predictions that humanity will colonize space in the near future. It's a somewhat natural reaction, given how many previous projections didn't work out, and NASA's recent cuts haven't really helped. Yet when you hear that Commander Chris Hadfield, one of the most recognizable personalities from the International Space Station, predicts the creation of a permanent moon base within 40 years, it's hard not to feel a little optimistic once again. "It's a pattern we have been following for the last 70,000 years," Hadfield said at the Science Museum in London. "We gradually made our way around the world. In the last 100 years we have got to Antarctica and now there are people who live there for months at a time. I think within my lifetime we will see a permanent lunar base. Setting up a permanent habitation on the Moon will help make space exploration better." 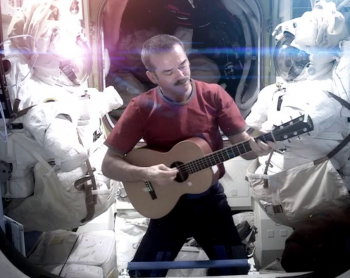 Once we're on the moon, Hadfield hopes it won't be long before we reach even farther. "The International Space Station currently is an extension of our self-awareness beyond Earth," Hadfield continued. "One small step away from our own planet. The next logical step is to go the Moon. I am really hoping that within my lifetime we will start living on the Moon. We have found out in the last couple of weeks that there is water in the soil of Mars. So I am also really hoping that in the lifetime of our children we will be able to start digging that up that on Mars as well." Hadfield adds that any future lunar base projects would likely include China and India, especially considering China's soft landing on the moon last Saturday. How exact his prediction timeframe will be remains to be seen, but given the moon's current international focus, it may not be wise to bet against it.